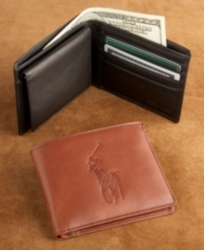 Carry your cash and credit cards in style with the Embossed Polo Pony Leather Passcase Wallet. This classic leather bi-fold wallet will fit comfortably in your pocket. Made with quality aged leather with the embossed Polo logo on front and embossed logo lettering on interior. Has a removable ID holder with window and multiple card slots. Great looking wallet!